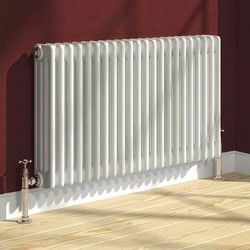 Reina Radiators > Colona 4 Column Radiator (White). 600x1370mm. Colona 4 column radiator in white. 7877 BTUs. Size: 600H x 1370W mm. Traditional radiator, four column design. Dual fuel: Can be fitted with an electrical element to provide heat even when your central heating is turned off. Heat output: BTUs: 12201 (3578 watts).